Camo Diaper Cake Discounts Apply ! 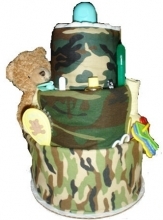 The Camo Baby Diaper Cake is an absolute must for any baby whose mom or dad is an avid hunter, serves in the military, or just happens to be a fan of camouflage. Comes in your five different sizes and your choice of green or pink camoflage. Your cake will be custom-made at the time of your order, so please allow an additional 5 days for our chefs to create your masterpiece. Cakes may not be exactly as pictured due to creative differences and product availiabilty. Please be assured that all items in your cake will be equally wonderful.